Are you looking for reliable Ramsey asphalt curbing services? Call (201) 327-5258 today so we can set up an appointment to get the process started. Check out our current online sales and coupons when you click here now. Asphalt curbs make an effective and attractive border for most parking lots. They look like a natural extension of the parking lot itself, and provide great protection where it’s needed. Far from being an add-on at the end of a paving project, safe and successful asphalt curbing requires planning and precision during installation. People in your area are talking about our asphalt services. Click here to find out what they’re saying! Why Do I Need an Asphalt Curb? Every asphalt parking lot will benefit from asphalt curbing in a number of different ways. They are used to prevent cars from driving off the edge of the parking lot, they help protect landscape islands that have been placed inside the parking lot, and they can prevent leaves, grass and mud from being washed onto the parking lot during a heavy rain. Asphalt curbs can also help divert water runoff so it moves away from the parking lot and toward catch basins. If you already have asphalt curbs and they need repairs, you will notice the signs. Since an asphalt curb has been placed directly on top of another asphalt surface (the parking lot), there is not a sufficient base to offer support. It’s important that your contractor backfill the curb with dirt to provide the support it needs. If it hasn’t been backfilled sufficiently, it will crack and break if a car or snowplow nudges it. If you see cracks in your curb, or if it has moved from its original spot, then repairs will be necessary. Asphalt curbing requires an experienced touch for it to be a successful and effective barrier, and hiring a reputable contractor is definitely the way to go. Most of the time, the same company that provides the parking lot will create the curbs, as they are most familiar with the lot’s dimensions and special needs. As with the parking lot itself, drainage is one of the key components when it comes to your asphalt curb, so make sure the service provider you choose has done it before and is proficient in every aspect of the job. 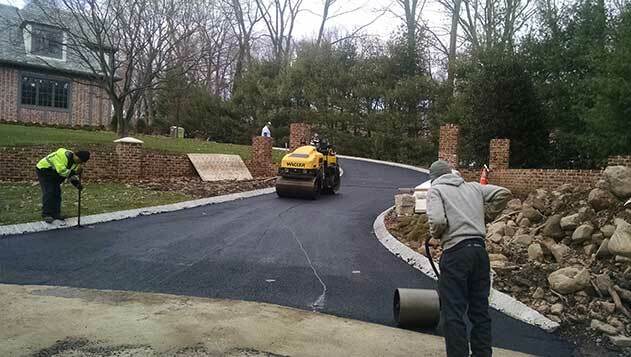 If you think your driveway or parking lot would benefit from an asphalt curb, or if you need repairs to an existing asphalt curb, call McFarlane Asphalt at (201) 327-5258 in the Ramsey, NJ area today. We will send a qualified contractor to your location to provide an honest estimate and a cost-effective solution.